Anne Tarasoff Interiors was born out of Anne's love of design, a passion for travel and family over thirty years ago. 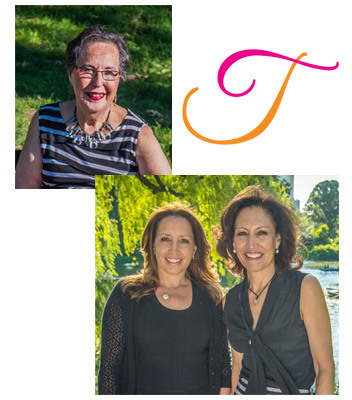 Her daughters Gail Tarasoff-Sutton and Karyn Tarasoff are her best friends and full partners in the firm. It's evident that a sophisticated sense of style runs in the family. The firm subscribes to the belief that creating a home should be a partnership between the designer and the homeowner. Educating our clients, exposing them to the many options that exist in the design world, and helping them make decisions for their home that fit within their budget and lifestyle is our main focus. Their work has been featured in many publications, cocktail table books, and design blogs. The firm has been involved in the planning, design and project management of apartments, homes and vacation residences in the tri-state area, Florida, Acapulco, Washington DC, and Greece. Anne Tarasoff Interiors has been honored to participate in many high profile designer showhouses such as, The Hampton Designer Showhouse in Bridgehampton and Southampton, the 2013 Project Design for The Ronald McDonald House of Long Island, and the upcoming 2014 Project Design for The Ronald McDonald House of Long Island, The Designer Showhouse of New York at the W Residence - downtown for Lenox Hill Healthplex, and Mansions and Millionaires. © Copyright. All Rights Reserved. No part of this website may be reproduced without written permission from Anne Tarasoff Interiors. Site: Frazzled Graphics.